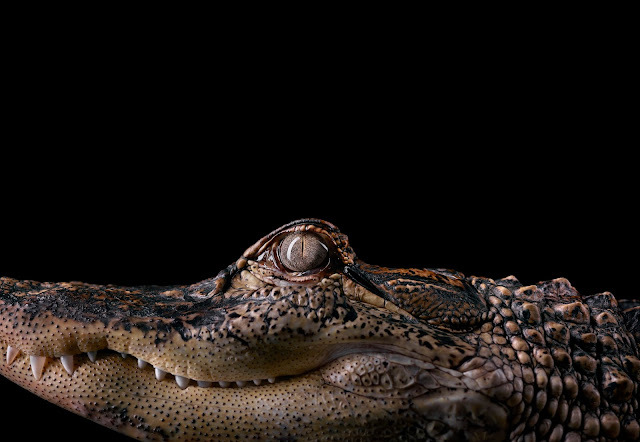 photo-eye Gallery Interview: Brad Wilson on AFFINITY Brad Wilson speaks to photo-eye Gallery about his intentions for the AFFINITY series as well as what it takes to photograph animals in a studio setting. AFFINITY opens Friday, Dec. 2nd at photo-eye Gallery. photo-eye Gallery is delighted to host local represented artist Brad Wilson for his upcoming AFFINITY exhibition. An artist reception will take place this Friday, December 2nd, from 5 to 7pm. The ongoing AFFINITY series consists of striking color portraits of captive mammals, reptiles and birds, which Wilson places in front of a jet black studio backdrop. Wilson provides the viewer with a rare and up-close opportunity to see the animal with impressive detail, which they would not experience at a zoo or in the wild. photo-eye Gallery asked Brad to share more on his inspiration as an artist and a few highlights from the project. AFFINITY opens Friday, December 2nd and will be on view at photo-eye Gallery through January 21st, 2017.
photo-eye Gallery: You have a BA in Art History and Studio Art, can you tell us who your most significant influences are and the inspiration behind your AFFINITY series? Brad Wilson: One of my early influences from University was the German Romantic painter Caspar David Friedrich. I was drawn to his compositions of solitary figures in vast landscapes. I felt the sense of space he created around his subjects gave them more gravity somehow and that really resonated with me. After college, when I started to get into photography more seriously, I loved the work of the early street photographers like Henri Cartier-Bresson, Edouard Boubat, Josef Koudelka, and Robert Doisneau. I found it very inspiring that they could make art out of the chaos of everyday life. It wasn’t until I got to New York City in the early 90’s that I began to focus on portrait photography - both in the studio and on location. I think the images of Richard Avedon and Irving Penn stood out for me, and shaped the way my own commercial work evolved. Like them, I was interested in more formal compositional arrangements combined with connected and revealing moments. Later, those influences carried over quite directly into the AFFINITY series. PE: The project began in 2010, how has it evolved, or have you encountered any unexpected obstacles or revelations along the way? 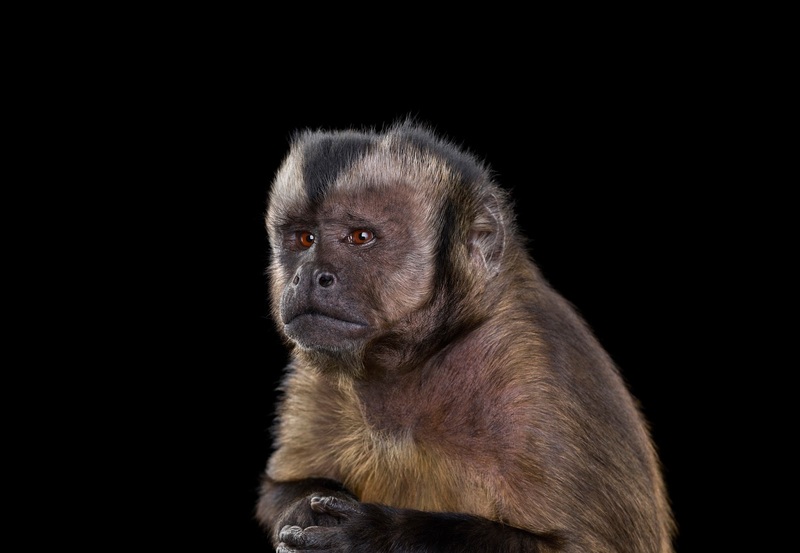 BW: The biggest obstacle happened early on in the project and involved finding animals that I could bring into a photo studio. The world of commercial animal trainers, sanctuaries, and even zoos is relatively small and guarded. In the beginning, before I had a body of work with animals, it was quite difficult to convince them I was completely professional and trustworthy. Once that initial hurdle was cleared, things went fairly smoothly, and the revelations that followed had more to do with the animals themselves, rather than the circumstances of the shoot. It didn’t take long for me to discover that they are what we, as a species, used to be: completely present in the moment and not distracted by the past or future. They pull you into that moment with them which is very calming - especially in our increasingly artificial world full of computers and cell phones vying at all times for our attention. PE: Do you live with animals now and did you growing up? 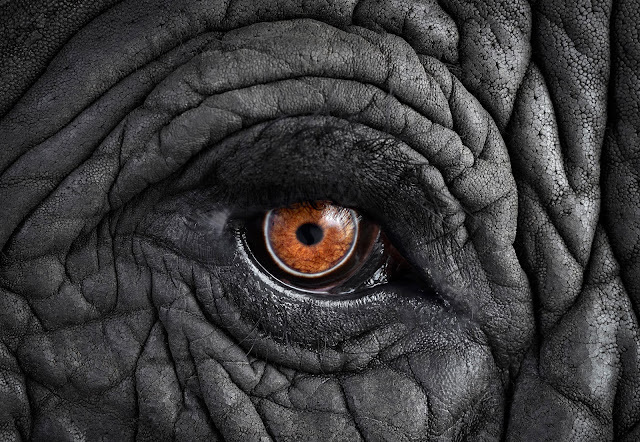 Has there always been an admiration for the animal kingdom? BW: I grew up around dogs and always had a fascination with the animal world. When I was young I wandered in the woods around my house looking at birds and squirrels in the trees and fish in the creeks. I often drew pictures. There was something completely honest (and elusive) about their lives. I found this compelling. For now, however, due to travel schedules and other factors, I don’t live with any animals. PE: The bond between some of these animals and their trainers must become quite strong, feasibly a huge commitment for the trainers, can you tell me more about witnessing that connection in person, and is there an animal in particular you felt a strong connection with? BW: All of the trainers, handlers, and caregivers I’ve met have made an extensive, life-altering commitment to the animals they work with - one that often spans many decades and involves tremendous time and financial resources. It can take many months of daily work for an owl or zebra or baboon to accept a human presence in their lives. When it happens, it’s quite remarkable. Obviously, since I could not put in this kind of time with the animals I photographed, my interaction with them was very limited. There were a few exceptions - most notably with the African elephant. She was very approachable and her profound presence and intelligence was something I strongly connected to. Wilson working with Kangaroo and trainers in Los Angeles studio, 2011. PE: What is your most memorable encounter with an animal on set? BW: One of the most memorable encounters was with the mandrill - the world’s largest monkey. He was boundlessly energetic, vocal, powerful, and expressive. From the moment he entered the studio in Los Angeles he announced his presence by slamming doors, knocking over equipment, and hitting my leg. His trainer remarked that the mandrill’s best (and only) trick was not killing me. I was warned not to touch him, talk to him, or look at him. Despite these limitations, I found him to be a remarkable and compelling creature - and exceptionally beautiful. 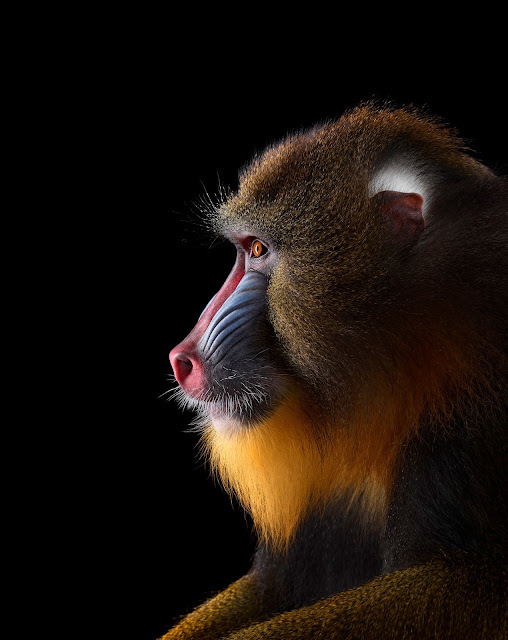 Even Charles Darwin said of these monkeys: “No other member in the whole class of mammals is coloured in so extraordinary a manner as the adult male mandrills.” Capturing a still and connected moment with him was a special and exhausting challenge, but well worth the effort. He was unforgettable. PE: Do you have a “unicorn” or animal you are most eager to photograph next? BW: I would have to say a gorilla. So far that’s been impossible. Since they are critically endangered and extremely dangerous, it’s unlikely I will get the opportunity unless some special circumstances arise in the future. Also on the wish list is a panda, a grizzly bear, and a wolf - all slightly more feasible subjects. PE: In the past, you have worked with models and celebrities in the studio, where you have complete control. What is it like making portraits of subjects you literally have no control over? BW: You have to throw most of your standard photographic playbook out the window and simply wait patiently for a decisive moment with each animal in front of you - a process I’ve described as a meditation in the middle of organized chaos. Although working with human subjects can, at times, be challenging, you always have the advantage of verbal communication to direct them. With animals you have no such luxury. For the most part, they do what they want. You have to create a space where they can relax and feel comfortable, and hopefully, with this, comes the opportunity for an interesting photograph. In many ways, however, this was the whole point of the project - to take a journey into the unknown. This is often a valuable part of the creative process. 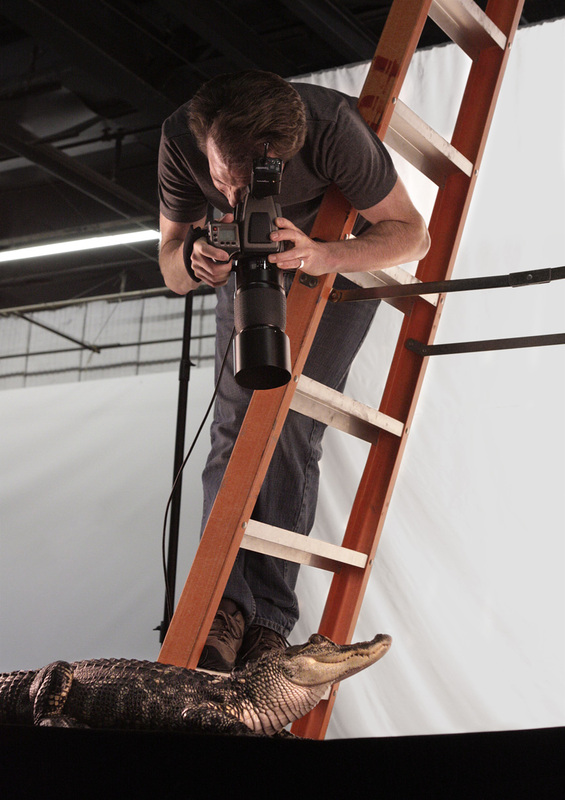 Wilson photographing an alligator in Los Angeles studio, 2011. PE: Let's talk process and technical, and how your images provide the viewer with such exquisite detail. BW: Due to the costs involved and the rarity of many of the animals, I realized early on in this project that it was unlikely I would get to photograph each of them more than once. Because of this, it was very important for me to have the best image quality possible to create a lasting document that might stand up well over time. From the beginning I’ve been using a PhaseOne P65+ (60 megapixel) medium format digital back with a Hasselblad H1 camera system. 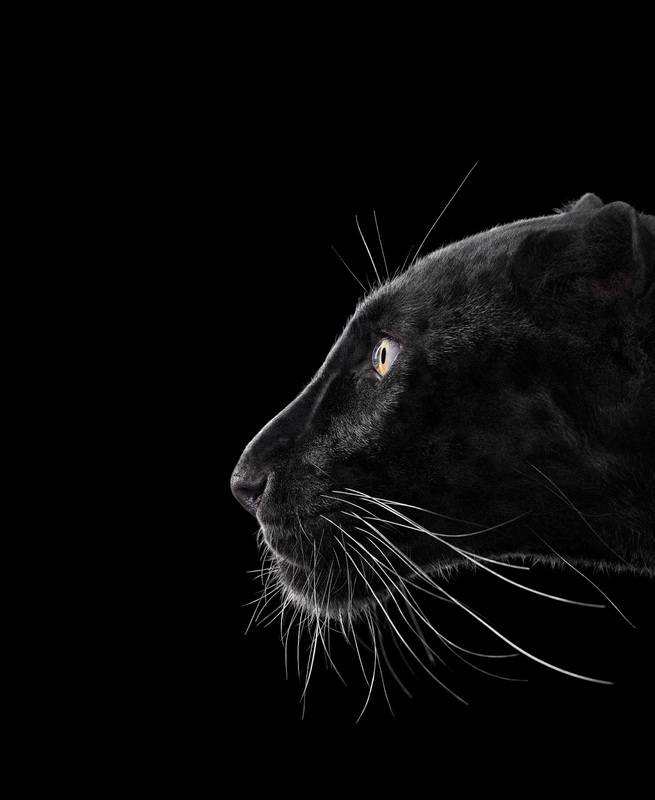 Along with the lighting, this created an extremely sharp and detailed image that revealed the complex visual beauty of the animals. It was a goal of the project to provide the viewer of the final images with this type of experience - something that would be nearly impossible in a zoo or in the wild. PE: As an accomplished commercial photographer who has successfully made the transition to fine art, can you offer any advice to other photographers hoping to develop both realms? BW: The best decision I made early on in my career was to move to New York City. Working first as a photo assistant and then as a commercial photographer allowed me to be immersed in the medium full-time. From that immersion arose opportunities and ideas that might not have developed otherwise. Also, a large metropolitan area offers exposure to a variety of jobs and fellow artists, as well as diverse museums and galleries - all things that can serve as inspiration. Besides that, I think my other primary piece of advice would be to work hard towards your own individual style - something distinctive that is not necessarily in line with current trends. Something unique or compelling in the commercial world can lead to fine art series and vice versa. 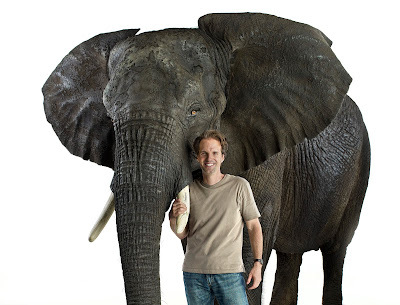 Wilson with African Elephant in a Los Angeles studio, 2010. Works from AFFINITY are Archival Pigment Prints and are available in limited editions of three sizes starting at $1,250. For more information, and to purchase prints, please contact Gallery Staff at 505.988.5152 x 202.